*** Sherry Cheever is sitting out this blog hop. You can see what she has been up to on her blog,Walkin on the Bad Side. Enjoy the E-Team creations! 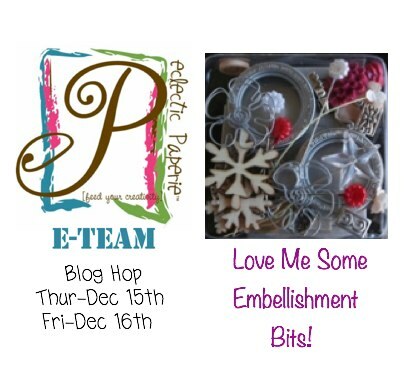 I'll be back tomorrow to post my project for thie final E-Team blog hop of 2011. Wishing you some holiday cheer today! I had fun seeing all the gorgeous creations on the blog hop today and wanted to stop by and thank you for all the inspiration you've given me thru out this year...and..to wish you a Happy Holiday! Beautiful projects! loving all the bits in that kit! Love this bits kit! Beautiful projects today. inspiring projects from the DT...stunning works! i love your blog hops, thanks so much for your generosity, i never win but enjoy seeing who does win those fab gifties. How much fun! So much inspiration! thank you! Lots of fun ... as usual! Your blog hops are always full of great ideas! Really creative designers, thanks for the chance to win. Thanks for an amazing blog hop! Such inspiring projects! Looking forward to seeing all the wonderful creations.